The extraordinary courts of Assize established by the Bonomi government, right after the liberation, through Lieutenancy Decree Law n°142 of April 22, were special judiciary bodies with provincial jurisdiction and composed of one judge, appointed by the First President of the Court of Appeal and acting as President of the court, and four jurors whose names were drawn from lists of adult citizens of “pristine political and moral conduct” written by the Provincial liberation committees with the agreement of the Court’s President of the chief town. In the post-war period they had to judge defendants charged with “the collaboration with the German invaders” during the ruling period of the Italian Social Republic. In other words they had to judge Italian citizens who, after September 8, 1943 perpetrated crimes against the loyalty and military defence of the state set forth in Article 5 of Lieutenancy Decree Law n°159 of July, 27 1944 including «any form of intelligence or correspondence or collaboration with the German invaders and any form of help or assistance provided to them”, both militarly and politically. The very same defendants were also trialled for the fascist crimes committed during the twenty years of the regime (art. 2 Lieutenancy Decree Law n°142 of April 22, 1945 referring to art. 3 of lieutenancy decree law n°159 of July 27, 1944). Even if the scope of action of these extraordinary courts of Assize, later turned into Special Sections of the Assize Court with a partial change in their panel of judges (with the introduction of an additional judge and an additional juror), was enormously limited by the general pardon granted in June 22, 1946, these judiciary bodies were active in Italy since the very first months after the war until the end of 1947. The sentences issued by these courts, even if formally inadequate and still strongly politically biased, were able at least to describe forms and modes of crimes chargeable to Republican fascists in the first post-war years when the public opinion still had a quite vivid memory of the suffered violence. 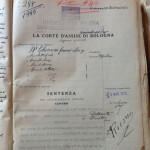 The files of the lawsuits investigated and debated in Italy, and also some of those dismissed after the preliminary inquiry phase, often include, non only police reports and questionings minutes, but also copies of documents relating to violent crimes perpetrated on civilians and partisans written by the officials of the Italian Social Republic.